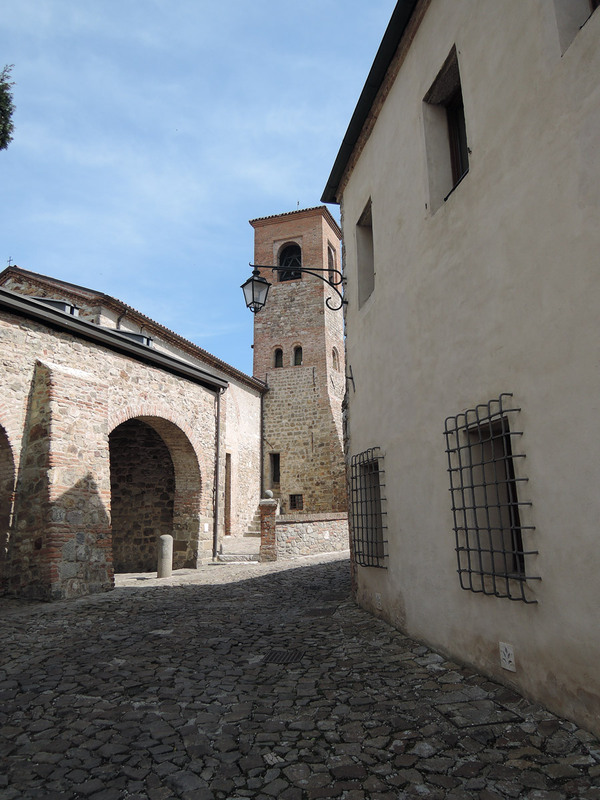 Arqua Petrarca is a medieval village perched on the Euganean Hills in the province of Padua. It consists of two parts, upper and lower. Once they were two distinct villages. In fact there are two churches: St. Mary and the Holy Trinity Church. Arqua Petrarca is among i Borghi più Belli d’Italia (the most beautiful villages in Italy) an association founded in 2001 to promote and preserve villages of great value and has been given the Bandiera Arancione (orange flag) of the Touring Club, a quality award due to excellency in environment and hospitality of some Italian small towns. This area is renowned for wine and olive oil production. The dish of the village is bigoli with meat sauce. If you want to learn more read my post regarding bigoli. But the typical product of Arqua Petrarca are the jujubes, dark brown fruits rich in vitamin C that look similar to olives. The Feast of the jujubes takes place in October. Here it is also famous the brodo di giuggiole (jujube broth), a liquor obtained from the dried jujubes. 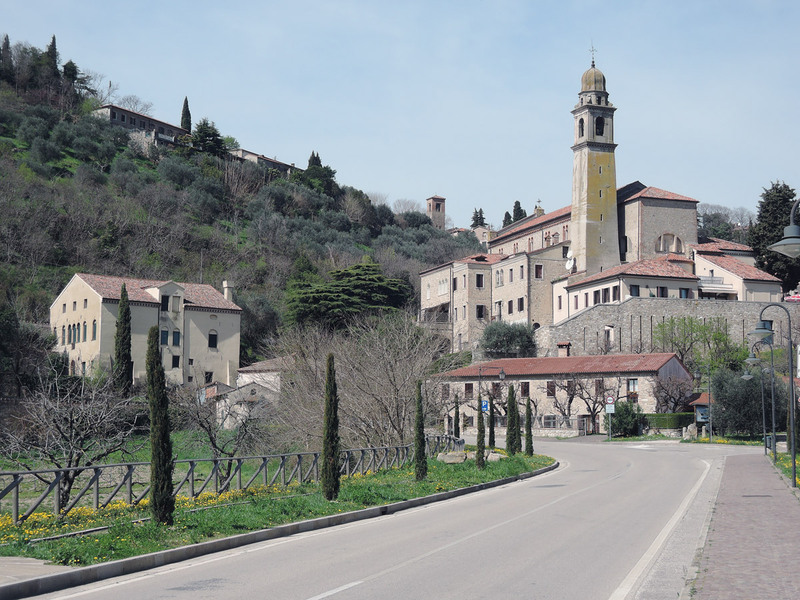 The fame of this hamlet is due not only to its beauty, but primarily to the fact that the poet Francesco Petrarca (Petrarch in English) spent here the last years of his life, in a beautiful house that we visited on this occasion. Here is also his grave, in the parvis of the lower church. Until 1868 the name of the village was simply Arquà. 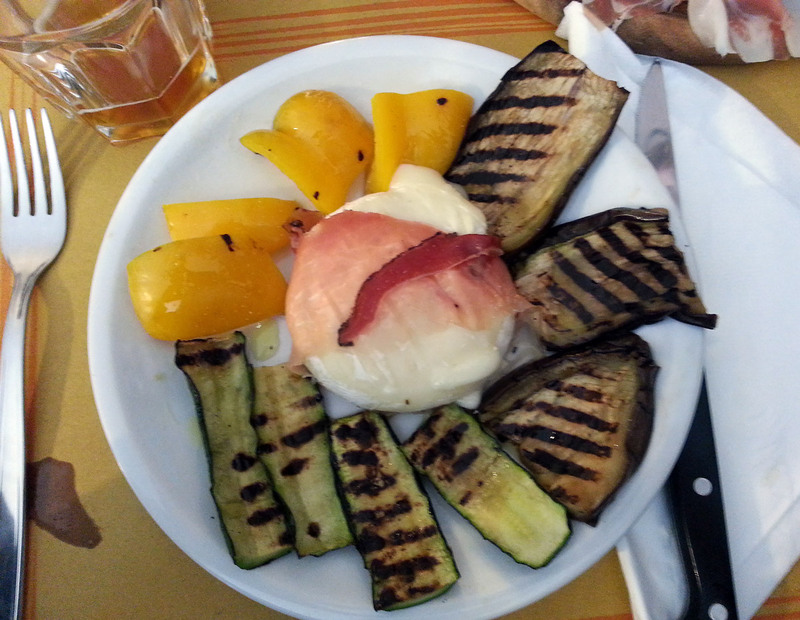 Petrarca was added, as an homage to the great poet, after the annexation to the Kingdom of Italy of the Veneto region. Ample woods of chestnuts, walnuts, beeches, ash trees and oaks covered the slopes of Arquà, but it were mostly the vine, the olive tree and the almond tree that helped to create the charming and typical landscape of Arquà. We walked towards the village and we arrived to the St. Mary church. This stone covers the cold bones of Francesco Petrarca; receive, o Virgin Mother, his soul, and you, son of the Virgin, forgive. May it, tired of the earth, res in the heavenly fortress. Petrarca’s house is located at the top of the village (follow the signs of and hand indicating with this words “ALLA CASA PETRARCA” meaning to Petrarca House). 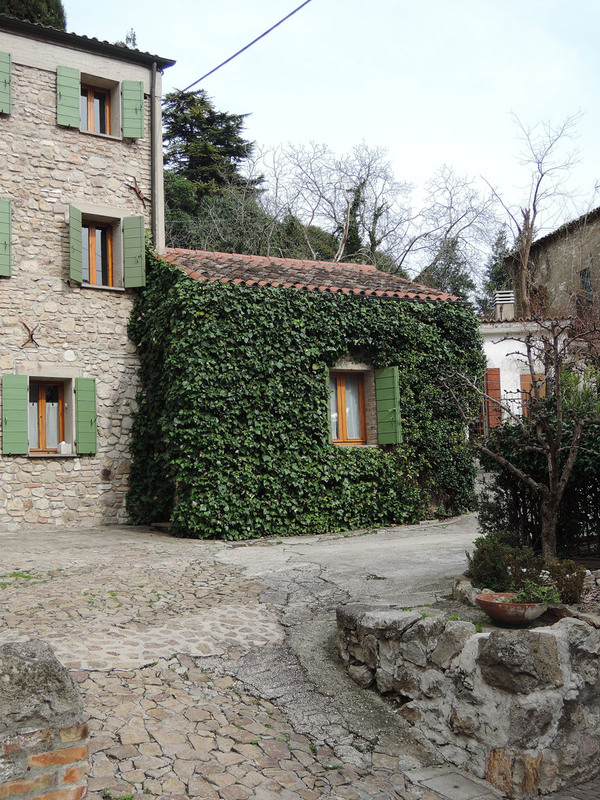 Here you can find my post about the visit to Petrarca’s house. Look at the Euganean hills down there, Foscarina; if the wind rises they will go wandering through the air like veils, they will pass over our heads. I have never seen them so transparent… One day I should like to go with you to Arquà; the villages down there are as rosy as the shells which one finds in the earth in myriads. When we arrive, the first drops of a fine sun shower will be robbing the peach blossoms of a few petals. We will stop under one of the arches of the Palladio to keep dry. Then we will look for the Fountain of Petrarch without asking our way. We will take his Rhymes with us in Missinni’s small type, — the little book you keep by your bedside and can no longer close now because it is swollen with leaves like a doll’s herbarium. . . .
She did not answer him, watching only the lips that said these delicate things and hopelessly enjoying the sound and their motion and nothing else, in a passing manner. She found the same distant spell in those images of Spring as in a stanza of Petrarch’s, but she could place a marker near the one and find it again, while the others were lost with the hour. He half closed his eyes, so that he might feel the rays upon his eyelids, once more suddenly seized by the joy of life. She imitated him, soothed by her friend’s enjoyment, looking from under her eyelids at his fresh, sensual mouth. They remained thus for some time hand in hand, with their feet in the grass under the sun’s caresses, feeling the blood in their veins throbbing in the silence as the streams become more rapid when the frost breaks up in spring. Her thoughts went back to the Euganean hills, to the villages rosy as fossil shells, to the first drops of rain falling upon young leaves, to the fountain of Petrarch, to all pleasant things. 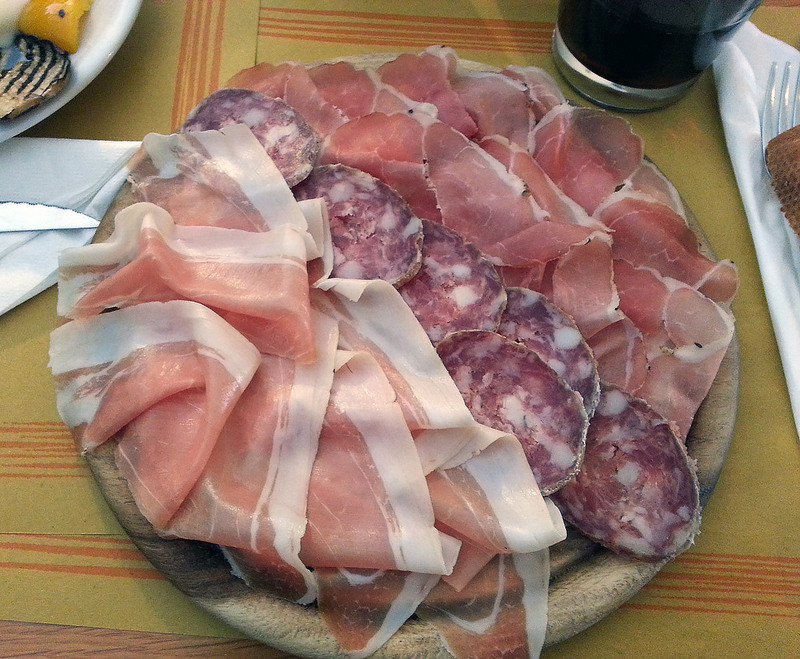 Since we arrived at the village at 12 am (during the lunch break) we stopped at a local enoteca (Enoteca di Arquà) to have a light and “quick” lunch with a plate of cold cuts, cheese and vegetables. They have a terrace with a view but it was full. Unfortunately all the visitors arrived there at the same time, so we waited about 45 minutes to receive our dishes, which were good, yes, but nothing special. Another fact that I disliked was the misleading sign on the outside, saying piatti caldi (something like cooked cuisine), while there was only one. Furthermore I didn’t like the atmosphere. I had the feeling that the owner was only falsely polite, but that he was actually upset by the crowd. Maybe if you do not come during the rush hour you can find a better climate. Anyhow, the village is marvellous. Here in the countryside, surrouned by the hills, especially on Sundays, you can “breathe a different air” (it is an Italian phrase), a different atmosphere. It seems that life flows more slowly. 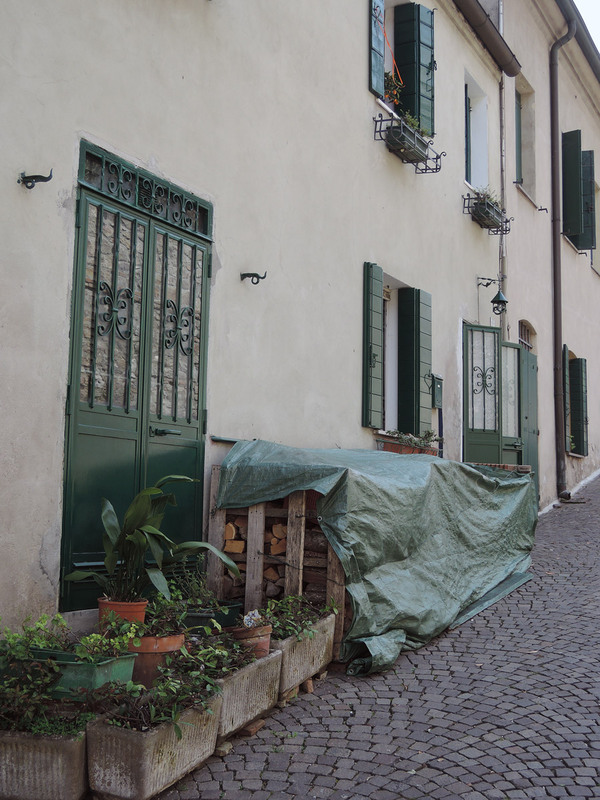 I also spotted a beautiful house for sale… It must be very nice to live here! 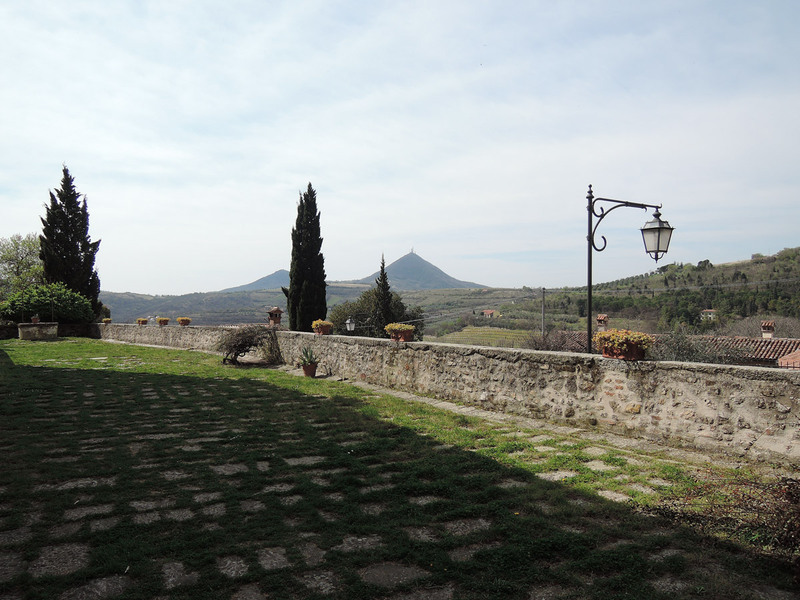 We walked up and down the village to discover freely his picturesque corners and the sights towards the Euganean Hills. 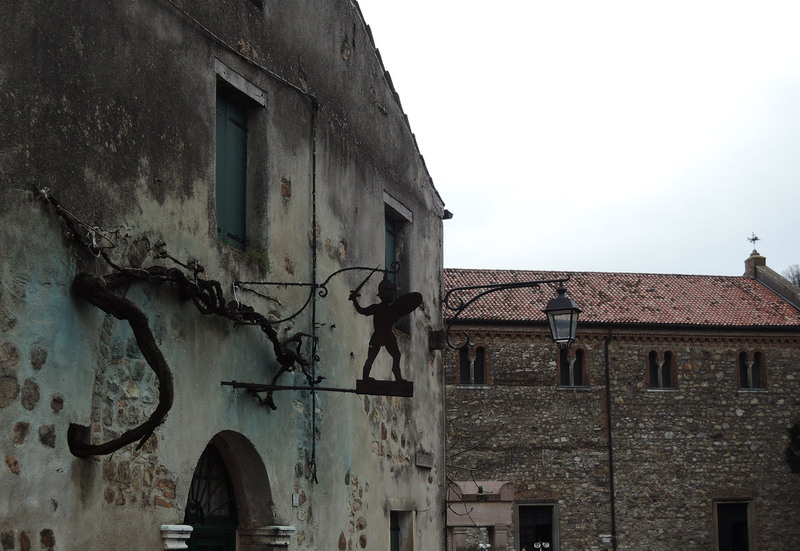 Arqua Petrarca is really worth a visit. It would be even better if there were more flowers on the windowsills. You know, like they do in the wonderful villages fleuries in France.